‘Boroplus Gold Awards’ is one of the prestigious award functions focused on celebrating the best talent in Indian Television Industry. The event had started in 2007 and is now celebrating its 10th Award Show. This event has taken place on 4th of July 2017 in Mumbai and some of the best talent in the Hindi Television industry has been recognized. The event is very popular among the Indian audience. The winners for this awards are selected by public voting where the list of nominees are presented to the audience through different websites and the audience vote for their favorite actor and actress in different categories. The awards in this event are divided into most popular, critics and special awards category. Some of the categories the audience is known to actively vote for their favorite celebs are Best Actor Male/ Female, Best Supporting Actor, Best Actor in Negative Role, Most Stylish Actor, Best Onscreen Couple, Best Child Artiste, etc. While Acting capabilities of the artists are the focal point of the ‘Most popular’ and ‘Critics Awards’, the technical qualities of the shows, Best Shows, Direction, Anchoring, TRP Gainers etc., are also honored. The special awards are presented to the Serials completing 1000 episodes, Top Stand Up comedian, Hall of Fame, Rising Film stars from television, etc. 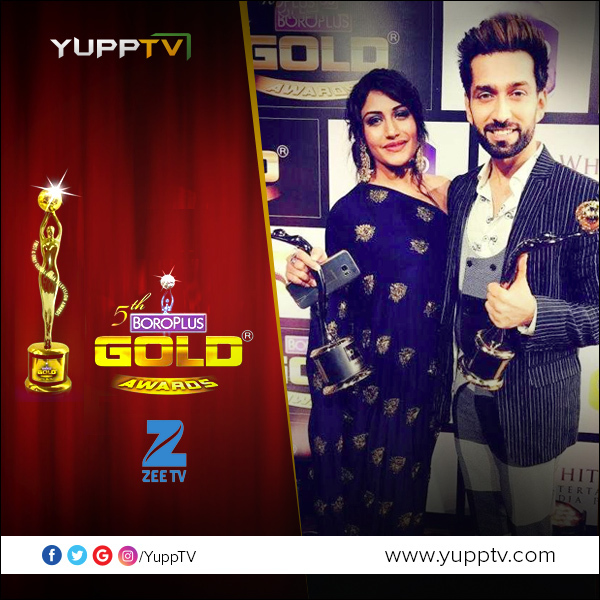 For the 10th Annual Boroplus Gold Awards held recently in Mumbai, Artists like Nakuul Mehta, Surbhi Chandana, Surbhi Jyoti, Rajat Tokas, Mouni Roy, Karanvir Bohra, Shabbir Ahluwalia from the top Indian Soap opera Kumkum Bhagya, Ishqbaaz, ChandraNandni , Naagin etc., have been nominated. Actors like Mouni Roy, Adaa Khan, Divyanka Tripathi, Ruhanika Dhawan, Abhishek Verma, Anita Hassanandani with husband Rohith Reddy, are some of the stars that have attended the star-studded night and won big. The event also witnessed best performances from Divyanka Tripathi, Karan Patel, Karanvir Bohra, Mouni Roy, Shivangi Joshi, Gurmeet Choudary, etc. The award show will be telecast on Zee TV on 16th July 2017, Sunday. You can watch the event on Zee TV Live on YuppTV website or through YuppTV App on your Android Smart TV.